Our favorite Ice Age creatures are back and this time the unique herd finds themselves grouping together once again to save Sid. When the Sid the sloth attempts to adopt three dinosaur eggs, the real dino-mother realizing her babies are in danger, abducts Sid and takes him and the eggs to a underground world filled with pre-historic vegetation and creatures alike. Manny, Ellie, Diego, Crash and Eddie join together with new friends in a lost world trying to save a dear member of their unusual herd. "Ice Age: Dawn of the Dinosaurs" represents the time when a studio should realize no more sequels are necessary. The story feels exhausted and only created in order to make more money on a series that has (in the past) been profitable. The voice actors all do a fine job in returning to their previous roles and new entry Simon Pegg as Buck is marginally entertaining, but the overall event is only half as good as it's predecessors. The 3D animation was lackluster and furthermore completely inferior in nature to other 3D animated films released this year. The story itself moves along at a decent pace and is filled with kid friendly jokes that have been typically utilized in the previous Ice Age films. That said, a majority of the film and those jokes, only seem like a re-hash of older material. In other words, nothing transpires in "Ice Age: Dawn of the Dinosaurs" that leaves you feeling the sequel was worthwhile or necessary. 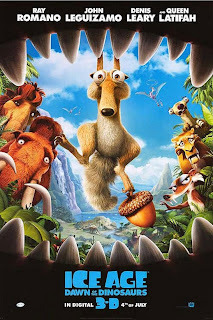 I will cede that Scratte, the female saber-toothed squirrel, was a nice addition to the cast and the hi jinks between Scrat and his elusive nut. Scrat has always been my favorite aspect to the Ice Age series and here in the third animated feature, he and his new female companion provide the majority of the laughs in the summer 3D CGI. Director Carlos Saldanha returns for his third effort in the Ice Age series and this time he does spend more time on what worked from the previous two films and less of what didn't. Namely Manny voiced by Ray Romano and Ellie brought to life by Queen Latifah bickering back and forth. Neither kids nor adults enjoy listening to a married couples inconsequential arguments and thankfully, Saldanha excised that plot development here in the third film. What Saldanha did spend more time on was Crash and Eddie who were one of the only reason's the second film was even worth a viewing. Voiced by Seann Williams Scott and Josh Peck, the two possums are entertaining for the whole family. In retrospect, despite quite a few short comings "Ice Age: Dawn of the Dinosaurs" is targeted for kids and my three sons all enjoyed it quite a bit. They laughed continuously throughout the 94 minute animated film and seemed generally entertained from opening to close. The youngest was the most vocal about the movie afterwards and continued to lament how much he enjoyed it for the next day or so. All three of them did agree however, that "Ice Age: Dawn of the Dinosaurs" is their least favorite of the three Ice Age films. Lastly, I suspect this isn't the last of the prehistoric creatures we'll see, but I can't say I will be all that excited when another sequel hits theaters.